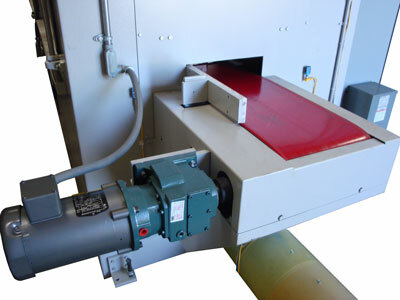 A turntable blasting machine offers the ability to blast a wide variety of parts and can easily be integrated with hand holes to optimize the machine for maximum use. Turntables can be fixed inside the cabinet for maximum cleanliness and for reduced plant space or can be mounted to a shuttle system to move them in and out of the machine for ease of loading and unloading. 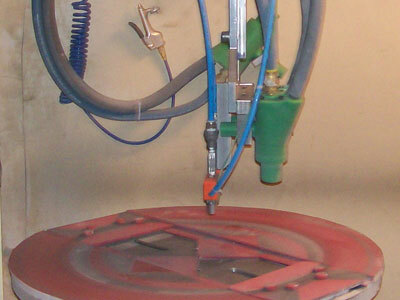 Whether fully automated or completely manual, Surface Blasting Systems will design your turntable to meet your needs. A pass-thru or conveyor style blasting machine offers the ability to blast a continuous supply of product with little to no adjustments. 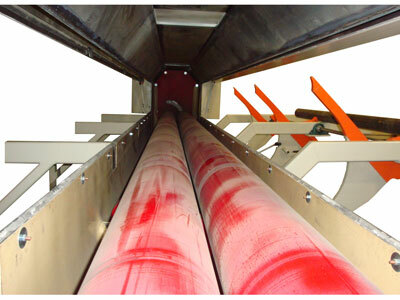 Product is generally fed into the machine via a conveyor from one end of the machine, passes through the blasting zone in front of fixed or mobile blasting guns or wheels and exits through an outfeed conveyor. 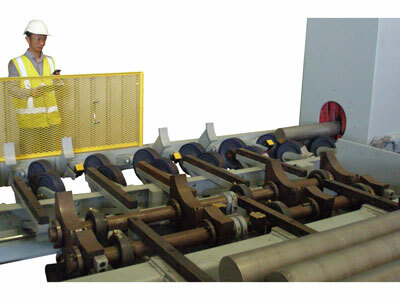 Pass-thru type equipment is beneficial to a facility where integration into an existing manufacturing line is desired. 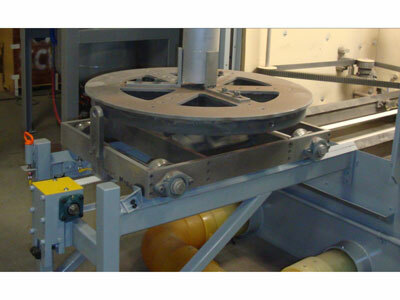 The machines can easily be adapted to communicate with surrounding equipment to ensure continuous product flow. From I-Beams to glass etching, Surface Blasting Systems will design a pass-thru system to meet your needs. 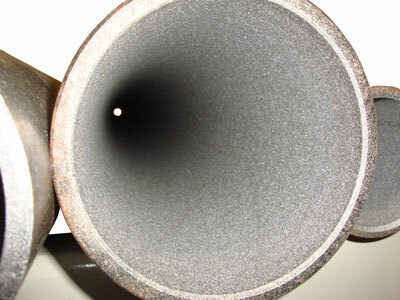 Considered leaders in the field of pipe surface preparation, SBS has designed and built automated pipe blasting systems for pipes ranging from 2" to 30" in diameter and up to 50 feet long. 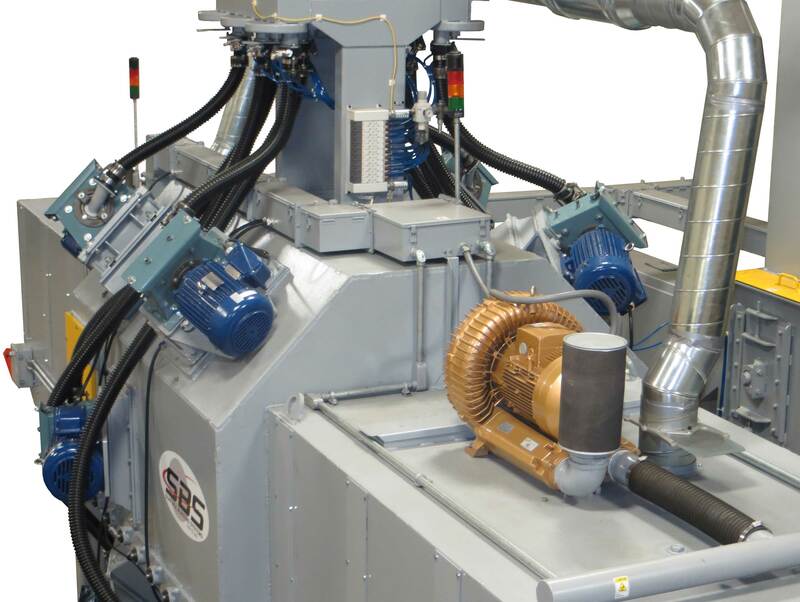 Working with nearly all of the oil industry exploration manufacturers (Halliburton, NOV, Baker Hughes, GE, Oil Lift, PV Fluids, Tierra Alta, and more), SBS pipe & tube blasters are robust, reliable, and high speed production machines. Whether your needs are for high throughput or simply process improvement, SBS will design your pipe & tube blasting system and spray coat systems to meet your needs. Used heavily in the aerospace and automotive industries, fixed station or robotic blasting systems are machines where the part is loaded into the machine (either automatically or manually) and once inside the machine, is stationary. A robotic gun nozzle handles all the motion necessary to blast the entirety of the part to be blasted based on preconfigured recipies or paths. Robotic systems are best suited for parts that are complex and/or delicate. 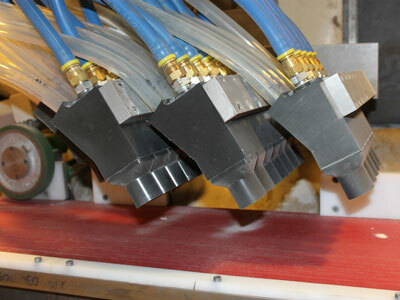 Full 8 axis capable robots can be utilized for nearly any application and for the most complex of blasting requirements. Contact Surface Blasting Systems today to discuss the possibility of implementing robotics into your grit blasting or peening project today. Airless or blast wheel style machines are generally intended for large batch production and high production rates. 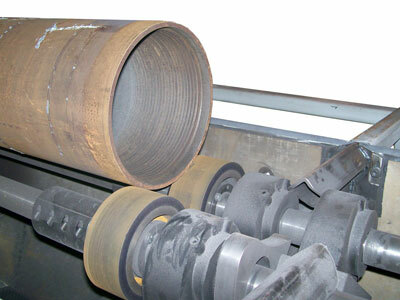 Stationary blast wheels accelerate blasting media (generally non-abrasive such as steel shot, glass bead, or non-hardened steel grits) to high velocity to abrade or peen the surface of the part. Blast wheels are capable of producing some of the highest production rates for large area surface finishing of any other industrial method. 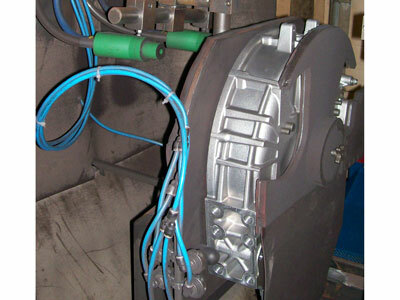 Wheel blasting is frequently used in shot peening applications also. 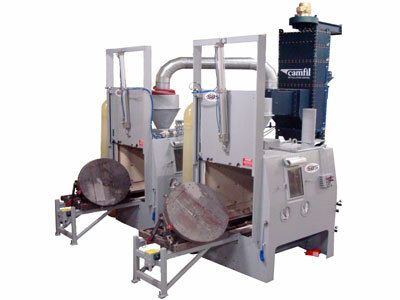 Utilizing one of the most efficient blast wheels manufactured, Surface Blasting Systems is ready to work with you to develop a custom wheel blast machine. A manual, or hand operated, style blasting machine is for the economically minded operation that is willing to utilize man power to meet their low volume surface finishing needs. 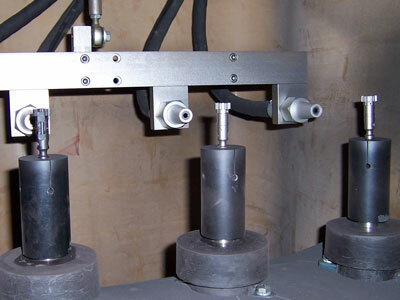 Most manually operated blast cabinets are pneumatically operated machines. An operator loads parts into the fully enclosed blast cabinet through access doors. Once the parts have been placed inside, the operator stands at the front of the machine to blast the parts. Heavy duty gloves, a large viewing window with quick change window protectors, and a well lit working area are all utilized to ensure a safe, comfortable, and simple job for the operator. 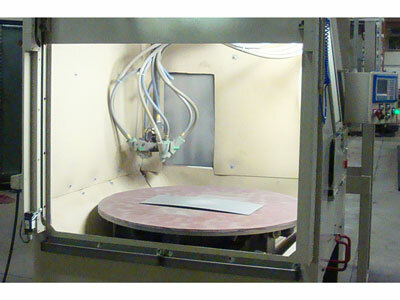 Sandblasting is so much more than simply a sandblasting cabinet and a blast gun. Dust collectors are used to filter and remove spent abrasive particles from the blasting environment. In many cases they may also be used to reclaim and reuse media that is still of usable size and quality. 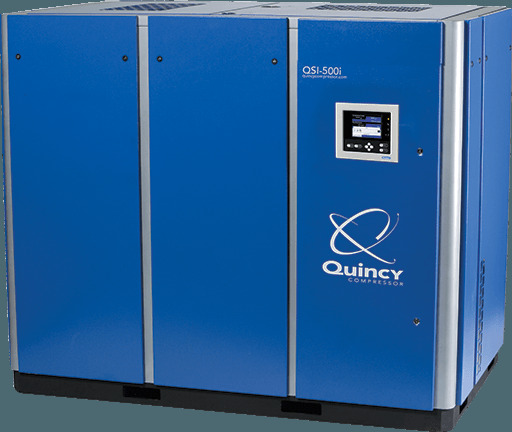 Air compressors and air dryers are used to supply your blasting equipment with a constant supply of dry compressed air. For help with determining how much compressed air your blasting machine will consume see this article. Safe, reliable, consistent sandblasting is everything SBS desires to help you strive for in your operation. Copyright © 2018 Surface Blasting Systems, LLC. All Rights Reserved.